I’m continuing to experiment with using iMovie to create digital stories. I’m having a lot of fun and learning new techniques. While I created two videos in the early aughts with STA, he did almost all of the technical stuff on them (running the camera + editing the footage in iMovie, etc). It’s great to learn how to do it myself. Part of my feminist techagogy (Feminist pedagogies in conversation/beside online technologies) is a passionate belief in empowering/inspiring/encouraging a wide range of folks how to engage in their own digital multimedia projects for critical and creative expression. With easy to use and inexpensive tools like iMovie, lots of people who aren’t tech/media experts can create, produce and share compelling stories. 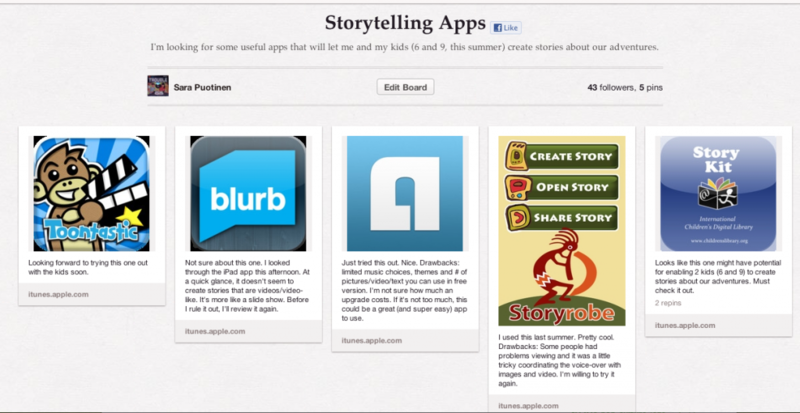 There are also lots of storytelling apps for creating movies. I’ve created a Pinterest board with some that I’ve tried or want to try. I like using iMovie (as opposed to final cut pro) because it’s automatically built in to all macs and fairly easy to use. So far, I haven’t had that much difficulty figuring out how to import photos and video and edit them. I’ve also experimented with splitting video and audio clips and slowing down some footage. One thing that I haven’t spent that much time on is sound. iMovie seems to have some serious limitations when it comes to sound; it’s hard to get a consistent volume between clips. Even though iMovie has its limitations, I really like how it enables me, someone who is not a digital media expert (or interested in becoming one), to develop enough skills to experiment with various ways for creating, telling and troubling my stories. Here’s my latest digital story project: Stories from the UP. I’m pretty happy with the various techniques that I tried out in the story. I’m also pleased with how I was able to use this story to trouble ideas of how stories, especially ones about family trips, can or should be told. Technical note: I used iMovie + built-in MacBook Air microphone + Pixelmator for photo editing. Last summer, for the second year in a row, Scott, Fletcher, Rosie and I took a trip to the Upper Peninsula of Michigan. I was born in the Upper Peninsula, Houghton to be exact. And although I haven’t lived there since I was 4 and a half, I still consider it to be one of my most important home spaces. We remember our trips to the UP with great fondness and nostalgia, as we look through Scott’s beautiful stylized instagram photos, but I know that even as these trips are deeply important and fulfilling, they aren’t always…fun or easy or relaxing. Bugs, over-excited yet easily-bored kids, too much togetherness, bugs, too cold water, lots of driving, did I mention bugs?, and the difficult and ongoing negotiations of 4 different, all strong, personalities living together as a family makes any trip messy…and exhausting….and a lot of work. But joyful, nonetheless. I want to craft and share stories that reflect a more troubling understanding of our trips to the UP, that convey the joy and difficulties, our fulfillment and exhaustion. Before the Path I like messy stories; stories that don’t always erase our conflicts, that allow us to put our sometimes contradictory experiences beside each other. Before the Place I like reverent stories; stories that allow me to express an ongoing love for a place that grounds me, that nurtures me, that inspires me and that reminds me of who I am always in the process of becoming. Before Characters I like character stories; stories that describe who we are, more than what we do…that expose our quirks and flaws and that represent us as human, not heroic. Before the Action I like small stories; stories that represent our everyday experiences and that help to reflect who we are in our habits. Not stories of grand or epic adventures, but everyday events, when we’re just hanging out and where the exciting ending is not reaching the top of a high mountain, but going to have mackinac island fudge ice cream at our favorite ice cream shop, The Berry Patch. Previous Previous post: Storify This!